List of all virtual servers defined in the currently active virtual data center. The virtual servers can be filtered by the name, hostname, status or tags. Virtual servers, which have similar uses or attributes can be tagged with specific names, e.g. web server, database, sql, Linux. 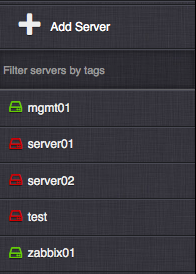 The tags can be used to filter and run tasks for whole groups of servers. The secondary menu provides quick access to virtual servers defined in the currently active virtual data center. This list can be filtered by virtual server tags. vCPUs - Number of virtual CPUs assigned to the virtual server. HDD - Cumulative disk size (GB) assigned to the virtual server. Add Server - Link to the add virtual server view. Deploy - Create and install selected virtual servers on compute node(s). The selected servers must be in a notcreated state. Start - Start the selected virtual servers. The selected servers must be in a stopped state. Reboot - Send an ACPI reboot signal to the selected virtual servers. Force Reboot - Immediately reboot the selected virtual servers. Shutdown - Send an ACPI shutdown signal to the selected virtual servers. Force shutdown - Immediately shut down the selected virtual servers. The ACPI restart and shutdown actions require the virtual server(s) to have a functional ACPI daemon running. Update - Push the current configuration changes of selected virtual servers onto their respective compute nodes. The selected servers must be in a running or stopped state. Some updates (i.e. adding or removing virtual server disks and NICs) will take effect only after stopping and starting the affected virtual servers. Undo - Restore configuration of selected servers to a state that is identical with the state on the compute node. Export - Export the selected virtual servers to an Excel sheet. Destroy - Remove the selected virtual servers and all server data from their respective compute nodes. The selected servers must be in a stopped state. Delete - Remove the definitions of selected virtual servers from the DB. The selected servers must be in a notcreated state. Freeze - Stop and disable management of selected virtual servers. The selected servers must be in a running or stopped state. 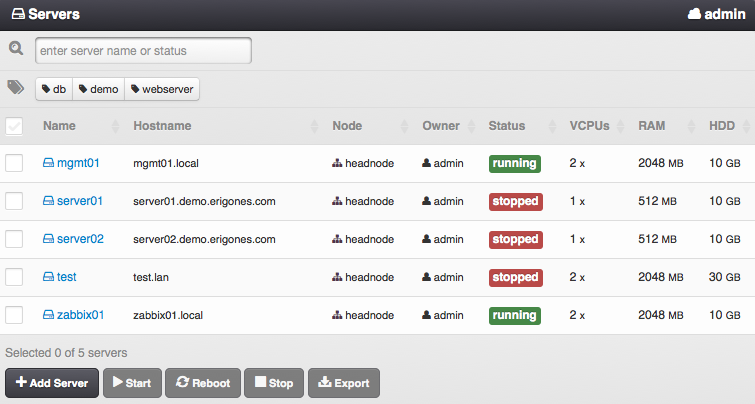 Unfreeze - Enable management of selected virtual servers. The selected servers must be in a frozen state.